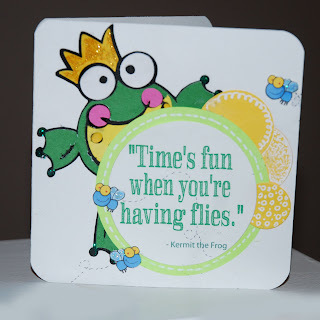 CardMonkey's Paper Jungle: A Day Fit for Frogs: Rainy and Overcast ... so Come Hop! A Day Fit for Frogs: Rainy and Overcast ... so Come Hop! The front image was cut using my Cricut Expression and Cricut cartridge, Sweethearts. 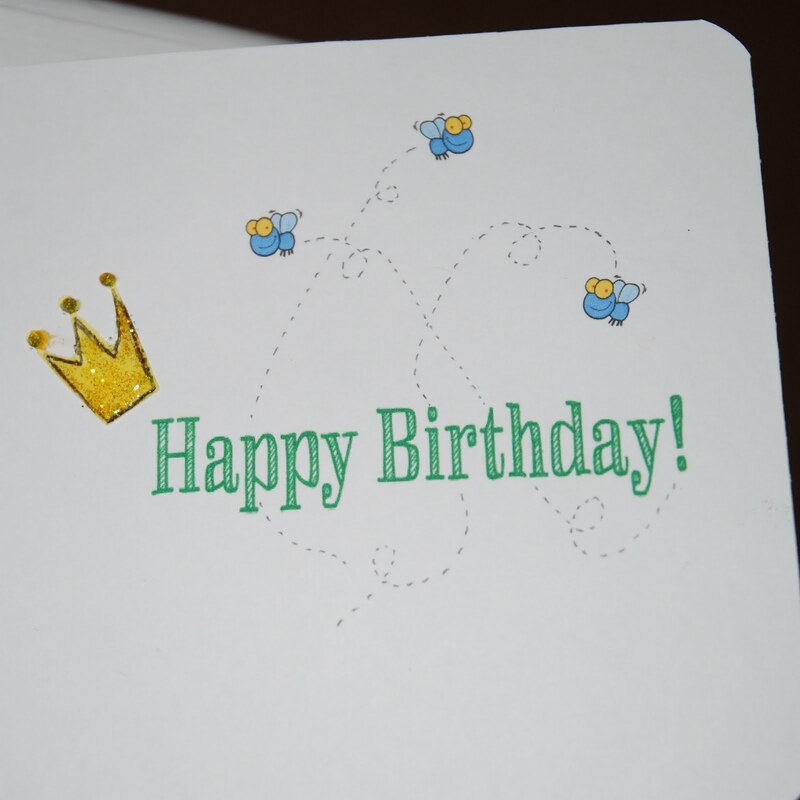 I used the "card" function so the image is cut from the yellow cardstock. I then backed the cut with a textured green Bazill, and put a snippet of gold glitter stock behind the crown cut. 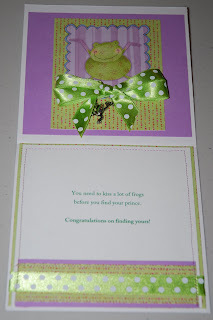 The card was double matted, machine stitched in a wavy/fun line using green glitter thread, and I added a ribbon bowtie to the frog. Inside, I made a top and bottom panel which really gives this card a feeling of substance. 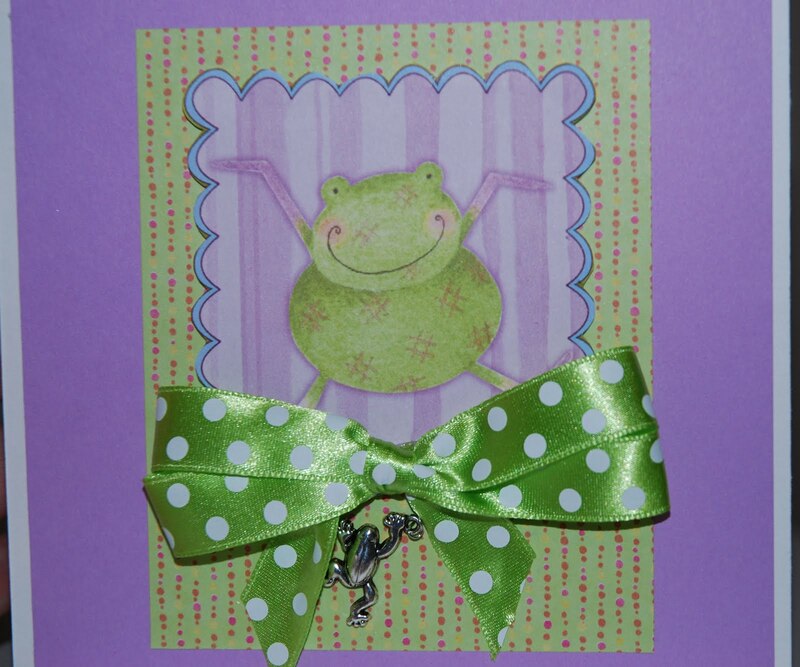 The frog charm is a Trinket from Michael's. I made the double loop bow from a polka-dotted Holiday ribbon I found in Michael's Christmas 90% off bin. I typed the sentiment and printed using my computer, Word program, and HP printer. 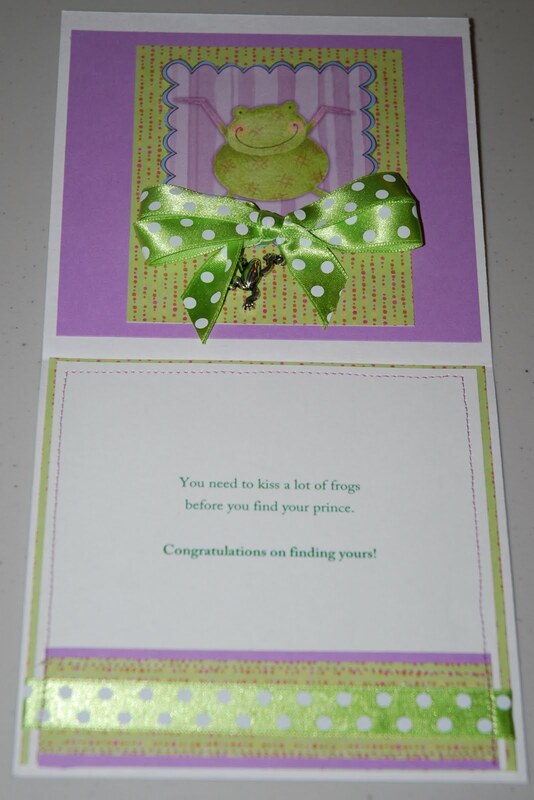 It says: You have to kiss a lot of frogs before you find your prince. Congratulations on finding yours! The front image was cut using my Cricut Expression and Cricut cartridge, Sesame Street Friends. I typed the (adorable!!) sentiment on my computer, then cut it into a circle using Spellbinders Nestabilities. I cut the additional circles with Nestabilities too. For the flies, I found the image on ClickArt Online, printed and fussy cut each. 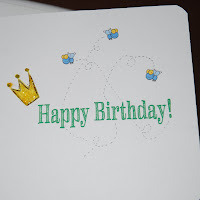 This is the inside sentiment, with more flies and a leftover crown cut from Card #1. This is an easel card. 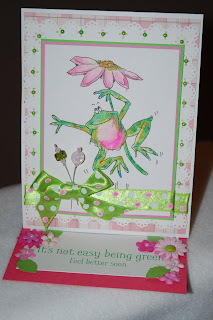 The front image of the frog and flower is a rubber stamp "Jump for Joy" from the Penny Black line. I colored it with Copic Markers and Prisma colored pencils, using the Gamsol technique. The image is double matted in pink and green, placed upon a mat I "punched around the corner" using Martha Stewart's Eyelet Lace punch set, and then adhered to a pink plaid paper. I dotted the eyelets with mini pearls that I colored green using Copic markers. 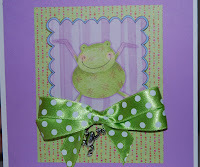 The ribbon bow is the same ribbon used in Card #1, only with alternate dots colored pink. The card pins on the front are my handmade "EmbEllies" made with glass beads. So which card did you like best? Why? What's a blog hop without some blog candy!? I have a terrific pair of Cutterbee paper crafting scissors for the randomly-chosen winner of my blog candy. 1. Be or become a follower. Please! 2. Leave a comment about this posting. In your posting, tell me which card here (#1, 2 or 3) is your favorite and why. Also, please leave me a way to reach you when you win! P.S. -- If you left a comment on the prior post I put up at midnight, don't worry ... you have an extra chance. It will still be counted in the total # of comments for the random drawing. I'm going back in and removing that posting so as not to be confusing. Feel free to comment here again as an additional way of winning! with us on this fun blog hop! Your cards are soo pretty, I really like the third one, first off, I love easel cards and the sentiment is what really got me!!! Great job. The "It's not easy being green" saying gave me an idea for a graduation card with a money holder! As always, I love your cards! Each card is cuter than the next! I suppose my favorite is the birthday card. I love the design and the papers you used. It's been a fun hop! already a follower - My fav is #2 card - love that image! All your cards are so adorable, but my favorite is #2. The frog on it is just too funny and cute! Ellen, they're all great, but the sentiment on the 2nd one clinches it for me! I love all three of your cards. It is so hard to chose which one is my favorite so I will say they all are. Thank you for a chance to win. 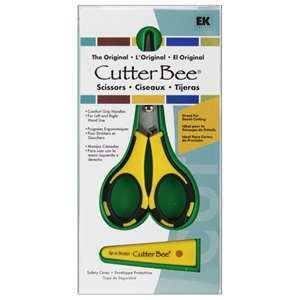 I have always wanted a pair of cutter bees!! Happy Easter. If I really HAVE to choose, I'd say #2, the birthday card, because it is such a twist. They are all very good, however. I love all of them but my favorite is the second one because of the cute sentiment. I'm a new follower. 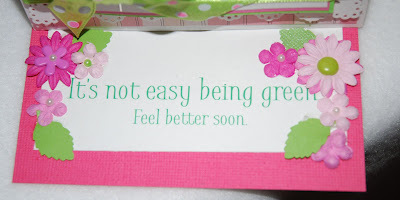 Of course they are all great, but I really like the green & pink colors in the Get Well Card! #2 !! LOVE those big eyes! Had me smiling out loud! And I am already a follower. Always a treat to stop by your blog to see what you are creating. Love all the cards. My favorite would be the third because of the colors and the watercolor feel. Great projects!!! TFS and have a Blessed Weekend. My favorite is the Easel card #3. I am just really into Easel cards right now and love the soft flower you had on it also. TFS Love your work. I hate having to choose a favorite so I wont! Im going to tell you why I like 2 of them best though. The first one I love the saying you put with it. Then the last one because you did an awesome job coloring it and its so cute! Love all of them but I like the color scheme on the last one best. Thanks for sharing. Okay all of your card are fantastic but, I think my favorite one is the #3 card if I had to choose..... I read your post.. I think I'm going to have to make you my new best friend girl cause you are too funny!!!! I had to chuckle at what you wrote. Thanks for stopping by my blog earlier today I appreciate it. Ellen, super cute cards, as usual, I loved them all but I thought the second one was cute I loved the little saying all mixed up....cute! 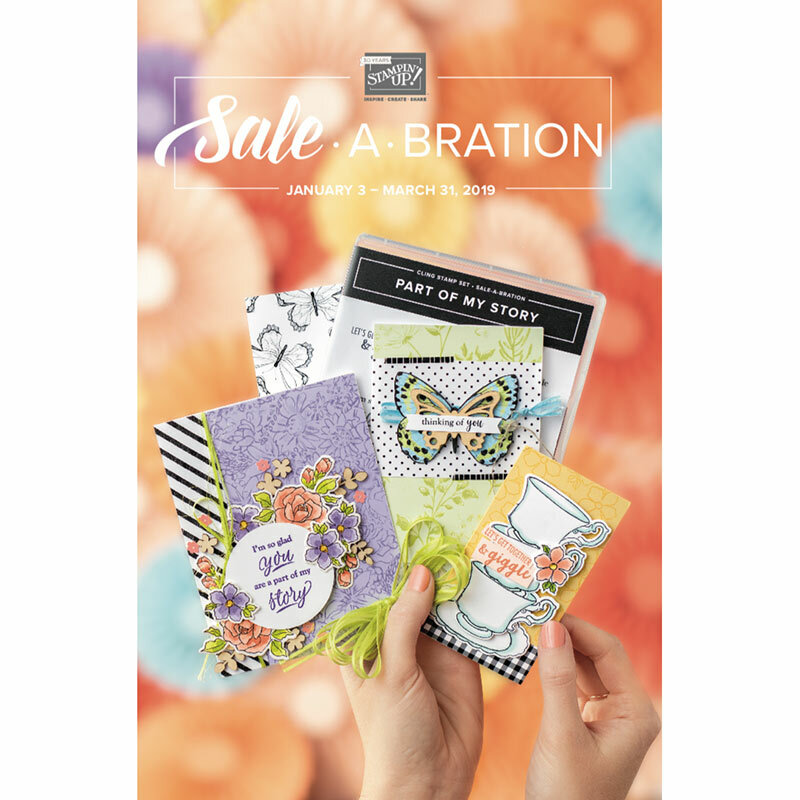 I like the third card... the easel card because I love easel cards and this one is just so cheery! TFS! Toadily GREAT cards...all of them. If I had to pick a favorite, it would have to be #3 the easel card! I love the color scheme, stamp & sentiment. It all goes together so nice. TFS! Card #3 put a smile on my face as soon as I saw it. Thanks for sharing. 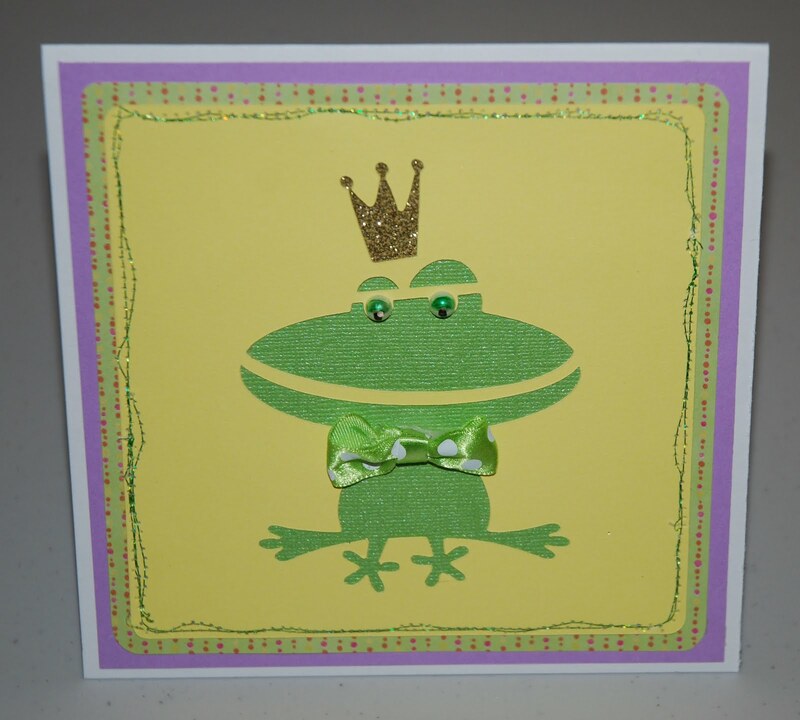 Three toad-ally cute cards!! I love them all! I am right there with ya....nothing but rain about every day!! Good crafting days but I really want to get out and work in my flower beds! 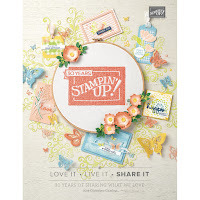 Your cards are amazing, I hat e to pick just one, but I do favor # 3, I am toadally in love with these easel cards, and I love the stamp also the detail on this card,and those pins are sooo much fun! love #2. Great!!! TFS I'm your newest follower. I'm not sure. 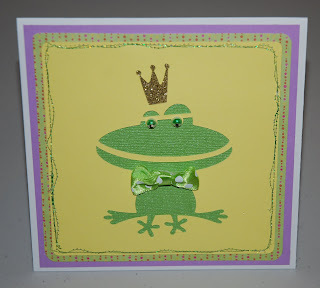 I LOVE that crown in the 1st- very cute accent for a frog. I really like the frog image in the 2nd and love your coloring in the 3rd. I really like all three cards but I think my fav is the 3rd one.. I really like that litte from with the flower.... and i love the saying.... I am already a follower!! Great cards. My favorite is card #3. I like this card the best because it is a easel card and I love your coloring. I need to practice coloring in my stamps. I haven't found the right tools or technique that makes me happy. I am a big fan of the different folds for cards. Already follow. My fave is no. 3 because of the girliness and stic pins. You do such a great job. Or something much more colorful like that :) So the pink looks great with the green. My favorite has to be Card #3. The colors, the cute frog, the tutu, LOVE, LOVE, LOVE it. :) Amazing! !